White elephant and Yankee Swap demonstrate gift giving gamification. 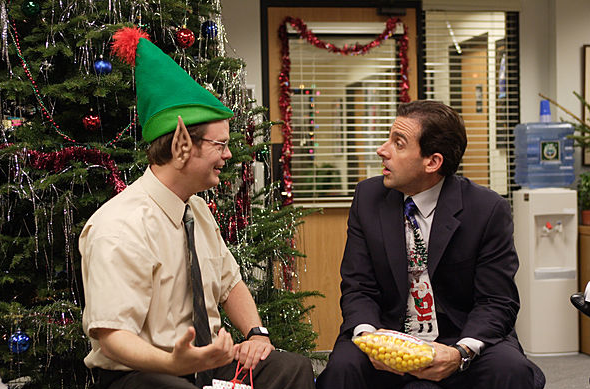 The act of giving a gift to an office mate is not unique, and nether is the office holiday gift party. What is unique is the way game play enters the equation. The white elephant gift exchange and the Yankee Swap combine gift giving and a game play into an example of gamification in action. We found the following information from Office Angels to be a good resource for the understanding of game dynamics within the workplace. We trust that you will find this information helpful. Games and work hardly seem like a good combination, but people have become accustomed to playing games for fun and see them as a form of social interaction. According to David Koutsoukis, we need humor and we need fun, without either we only get glum. The author, in his e-book Workplace Fun Ideas, he puts forth several ideas that center around the concept of happy people being productive people. Research shows that a certain amount of fun in the workplace increases productivity and improves performance. A popular human resource concept is happy employees equal happy customers, which in turn will equal a better bottom line. Co-authors Dave Gray, Sunni Brown and James Macanufo have written a book titled Gamestorming. The book offers a rather different take on the staid, be serious office policy most people are used to. According to the writers, embracing and understanding the game mechanics yields rich benefits in the work environment. Gamestorming has been described as a set of collaboration practices that have been evolving since the 1970s. It centers round ad-hoc organizing of teams to design and develop ideas cohesively as a group. These can be considered a form of game play as individuals are thrown together suddenly to develop an idea. In other words, turn the exercise into a game that makes people happy and produces results. If we were to ask outright what types of games would be acceptable in the workplace, the common answer would be none. To most people, the word game probably brings to mind visions of solitaire on the office computer. Workplace games have a far greater depth of meaning. They put a structure to the chaos and stress surrounding creative work. By putting people in a group, the game rules become a method of information sharing. It is also a way to distribute the power or control equally among all the members in the group. The old system of hierarchy is abolished as the team gears up to work together, engaging in interaction, idea sharing and unified productivity. Workplace games should not make people feel pressured to play; rather the focus should be on people engaging in combined activities to see positive results. The skills required to play these sophisticated workplace games include the ability to work together, social skills, visualization, creativity, good listening skills, communication skills and improvisation skills. Success in the workplace relies heavily on communication; without it people end up functioning as islands rather than as a team. Making it a practice to play a few communication games to hone communication skills is fast becoming an accepted practice in many workplaces. Team leaders and managers need to choose games that will help people hone their skills, which in turn will benefit the overall performance of the organization. There are many games that can be used in the workplace to build a variety of skills, build character, shape thought processes and generally produce employees that are well balanced and happy working for the company. The motto with any type of workplace games program for employee progression should be based on introducing an element of fun to the workplace environment. Note: A friend of mine, Chris Brogan did a review of the Gamestorming book.